Sonya Rapoport, “Biorhythm Calendar: May, 1980”, 1980. Multimedia collage on continuous feed computer printout vellum on found calendars with grommets and plastic spines, 3 pieces, 31.75” x 45.25” each. “Biorhythm” (1981), Sonya Rapoport’s interactive, computer-mediated “participation performance” is a data-oriented yet playful exploration of the human body as computer. In the late 1970’s there was a surge of popular interest in the body’s natural circadian rhythms. Using a commercial kit to predict her daily biorhythms, Rapoport recorded her physical, sensitivity, and cognitive cycles throughout the year 1980. 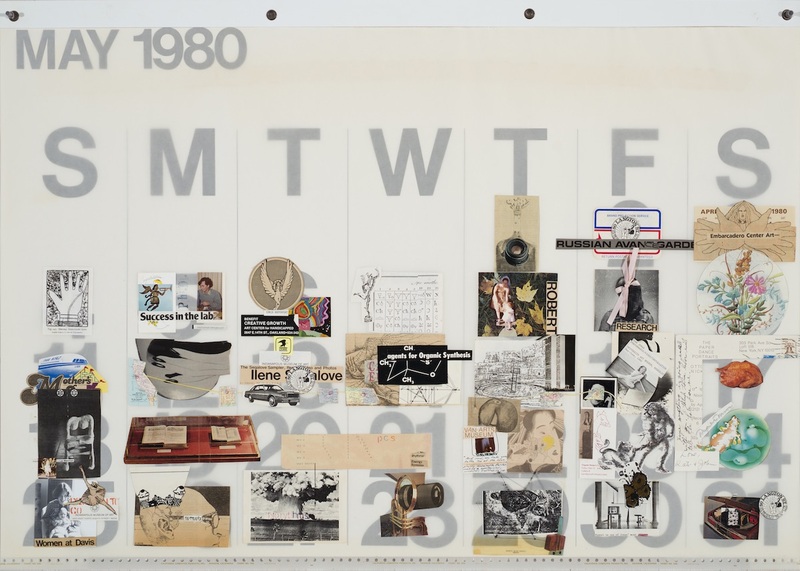 Making use of an oversize calendar, she created each day a small collage with the ephemera of her everyday life and paper records of her art practice – a fascinating autobiographical portrait. Rapoport represented her data via an artist book in which graphs of her own biorhythm data is compared to computerized predictions, which appear as sinusoidal curves. Printed in color on acetate are snapshots of her calendar collages. Sonya Rapoport, “Biorhythm: Postulate and Performance” (detail) 1981. Plotter print, pencil, colored pencil, colored type, acetate collage on translucent continuous feed vellum. 34 pages in 2 folios, 11” x 11.75” each. 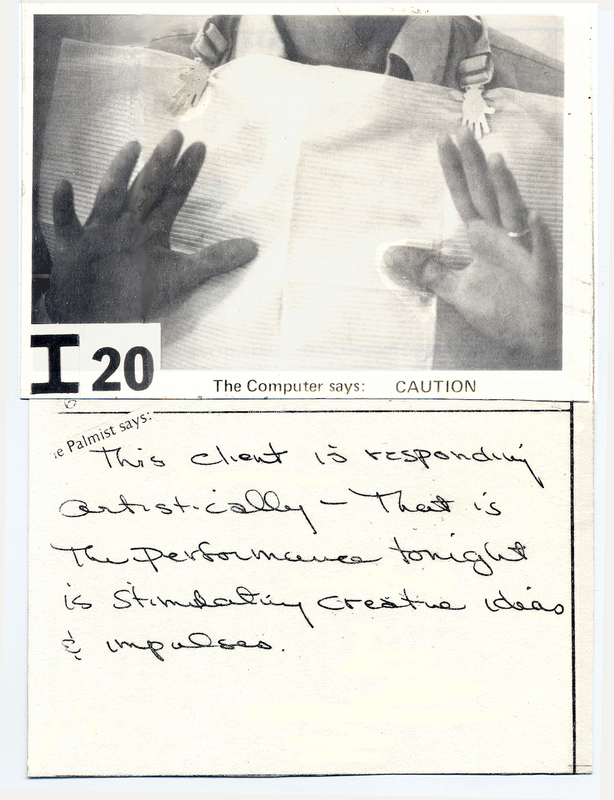 The “Biorhythm Audience Participation Performance” at Works Gallery in San Jose, 1983 can be seen in this original video documentation. A greeter asked gallery visitors how they felt, recorded their answers, and assigned them numbered, color-coded wristbands based on their response. A computer operator entered their data into a custom program that predicted their feelings using Biorhythm Theory. They also visited a palm reader and had their spontaneous hand gestures photographed while wearing a dentist bib – non-computerized methods of intuiting feelings. Sonya Rapoport, “Biorhythm (The Computer Says I Feel), photodocumentation and collage with response from viewer. A selection of primary source documents originally selected by Sonya Rapoport that relate to Biorhythm can be downloaded here: pdf, 67MB.